"Lutheran services will be held in the county service building, 18 church street, newton, starting sunday, march 8, at 2:30 p.m. ... if sufficient interest is shown it is planned to organize a congregation on a permanent basis and expand services and facilities. "From that first meeting grew Redeemer Lutheran Church, which stands as the oldest Lutheran Church in Sussex County. The 60 adults and eight children who attended that first worship service planted the seeds for a church that now serves over 500 members from more than 200 families, and that was responsible for the growth of a daughter parish in Blairstown. The Rev. Ewald Mueller, pastor of Bethlehem Lutheran Church of Ridgewood, conducted that first service. He was invited to Sussex County by Mr. and Mrs. Herman Kleindienst Sr., who had left the Ridgewood church when they moved from Bergen County to Stillwater in 1947. The family frequently made the long trip to Ridgewood to worship in their own tradition. The intention was to meet monthly. However, with such a large gathering in attendance at the first service, it was apparent that there was a need and desire for a church to serve the Lutherans in the greater Sussex County area. Pastor Mueller and a number of other pastors conducted worship services on a rotating basis each Sunday, until that summer, when the congregation was able to call its first pastor. The Rev. Frederick Chapman, a graduate of Concordia Theological Seminary, Springfield, Illinois, received his appointment as pastor from the Missouri Synod Atlantic District. He arrived at Newton in August and was ordained into the ministry on October 3. Over 200 Lutherans from around the state attended the ordination service. Music for the service was provided by Mrs. Edith A. Rights and the choir of the Ridgewood church. At that time, the name "Redeemer Lutheran Church" was adopted unanimously. During the months since the first meeting, the congregation had moved into the Grange Hall in Newton, and an organizing committee had been formed. Officers were Herman Kleindienst Sr., chairman; Waiter L. Codon, vice chairman; C. Burnett Freas, treasurer, and Ruth Ritter, secretary. The members of the committee were John Gaisler, Onrille Matthies, Paul Hilburn, George Rost, Robert Moore, Newton Woodruff, Willard Klemm, William Epstein, Richard J. Stark and C.F.W. Stanton. The congregation was chartered with 92 members on January 10, 1954, and incorporated on October 31, 1954. By 1956, when Mr. and Mrs. Henry Dahlen donated two-and-a-half acres as a building site for a church, the congregation stood at 230 baptized members and 145 communicants. After the property was received, Mr. Dahlen built a parsonage on the site. The property and parsonage were dedicated an September 23, 1956. A building fund campaign had been started in August of that year to raise $30,000 for the construction of a church edifice. In December, the church received an endowment of $4,000 toward the purchase of an organ for the future church. The endowment was donated by H.H. Heinrich of the H.H. Heinrich Co. of New York as a memorial to his wife, Elizabeth. Pastor Chapman said at the time that Mr. Heinrich was "unknown to the members of the church," but his gift made a favorable impression on them. 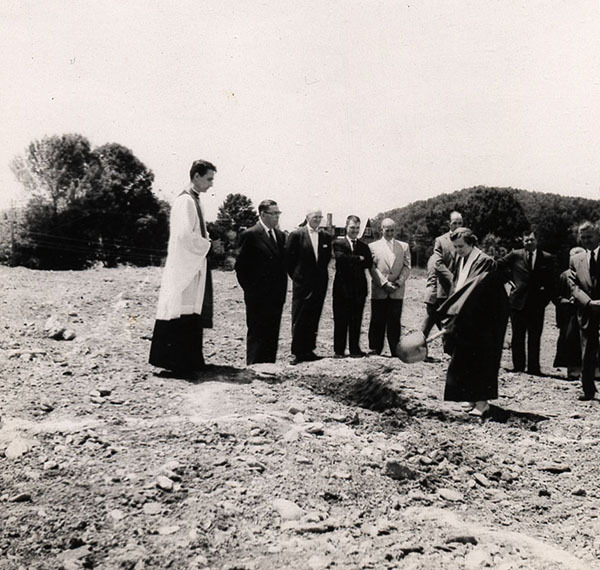 In June 1958, contracts were signed for the construction of the church, and a ground breaking ceremony was held July 22, with 200 persons in attendance. Soren B. Jacobsen of Lake Mohawk was the contractor, Robert Clothier of Newton was the architect. The new church would be of modern contemporary design, consisting of two buildings, joined by a long loggia. The main body of the church is designed with a steep roof, rising from seven to 57 feet. The plans also called for classroom and office facilities, and a fellowship hall with a kitchen. The hall was also to be used for Sunday School classes. The main church would seat approximately 250 persons. Mr. and Mrs. Dahlen made another donation to the congregation, which allowed the addition of a chapel and Bible study room in the space between the church and the fellowship hall. The chapel was given as a memorial to Mrs. Dahlen's parents, the Rev. and Mrs. I.L.P. Dietrichsen. The Bible study room was designated as a memorial to Dr. Waiter A. Maier, well-known voice of the Lutheran Hour broadcasts, with whom Mr. Dahlen had been closely associated during the development of the program in the early 1930's. 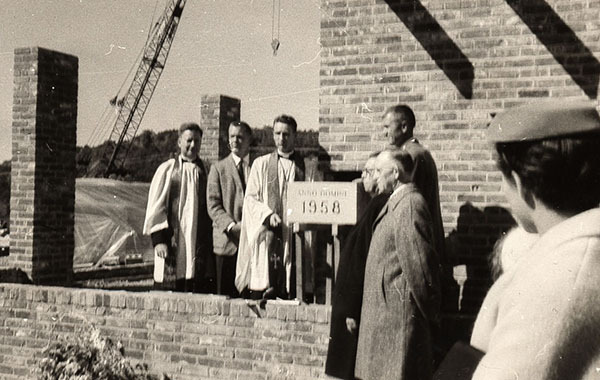 Construction proceeded quickly and smoothly, and the cornerstone was laid during the worship service on October 12, 1958. A time capsule placed in the cornerstone contained a list of all communicant members of the church and biographies of the pastor, church council and building committee members, the architect and the builder. Also in the capsule were a Bible and a copy of that weeks New Jersey Herald. The service began at the Grange Hall, and after the sermon, the congregation went to the building site for the cornerstone ceremony. Redeemer Lutheran Church was dedicated May 31, 1959. The Rev. Dr. Louis Henze, former executive secretary of the Atlantic District, Lutheran Church-Missouri Synod, spoke at the 11 a.m. worship service, and the Rev. Nornan Temme, associate director of public relations of the Missouri Synod, was guest speaker at the 4 p.m. dedication vespers. The Rev. Hans Voss, circuit visitor, was liturgist, and the Rev. Waiter Reuning, vice president of the Atlantic District, was lector. In December 1961, Pastor Chapman accepted a call to Good Shepherd Lutheran Church in Jamaica, N.Y. He had served the parish for seven years. The Rev. Charles Ertman of Hackettstown served as interim pastor for several months. The Rev. Arthur W. Lesslie, pastor of Grace Lutheran Church, Middletown, Conn., accepted the call to Redeemer and began his ministry here in June 1962. He stayed at Redeemer until 1971, when he accepted a call to St. Paul's Lutheran Church, Amityville. N.Y. During his pastorate at Redeemer, the congregation increased by 300 adults and children. In February 1972, the Rev. Bruce E. Rudolf accepted the call to Redeemer, and stayed with the congregation for almost 13 years. During his pastorate at Redeemer, the congregation began a Youth Canteen in conjunction with the Sussex County Association for Retarded Citizens; began Redeemer Nursery School; was active in the resettlement of refugees from Southeast Asia: began a mission congregation in Blairstown, and initiated a building expansion program. Pastor Rudolf left Redeemer to accept a call to become pastor of Emmanuel Lutheran Church in Patchogue, N.Y. The first pastor of the mission church at Blairstown, later called the Lutheran Church of the Good Shepherd, was the Rev. Edward J. Grant, assistant pastor at Redeemer. Since then, Good Shepherd has been pastored by the Rev. Robert Klemm, a nephew of Herman Kleindienst Sr. Many members of Redeemer who lived in the Blairstown area transferred their membership to Good Shepherd when it was organized in 1977. Miss Gloria Klawiter was installed as a deaconess of Redeemer in September 1982. Deaconess Gloria, as she was known in the congregation, served as youth minister. She left the staff in July 1987 but remained an active member or the congregation until October 1994, when she moved back to California. The Reverend Lynn A. Podoll came to Redeemer June 15, 1985, from Purdue University, where he served as associate campus minister while pursuing post-graduate studies in theology and counseling. Dennis Meyers joined the staff in September 1987 as Director of Christian Education and youth minister, and served in that position until. In May l993, Redeemer dedicated an addition, the first major expansion of its facilities. The addition enclosed the loggia and contains the community center, called Redeemer Hall; redesigned office space, and a new office for the pastor. At the end of 1993, Redeemer Lutheran Church had 512 members and about 120 children enrolled in the Sunday school, with a number of adults participating in adult education programs. In June of 1998 Pastor Podoll left Redeemer to answer a call to Emmanuel Lutheran Church in Broadlands Illinois. After more than one and a half years without a pastor, the Rev. Thomas Diamond was installed as the pastor of Redeemer Lutheran Church on February 13, 2000. After 10 years Pastor Diamond retired to North Carolina. In September 2010 the Reverend Brian Handrich was installed as Redeemer's new pastor.